Skynet is World First End-To-End Programmatic Television Advertising Marketplace. A product of SureWaves, Skynet represents a real paradigm shift in TV advertising. Bringing down the process of planning a TV campaign from weeks to minutes, Skynet also enables marketers to intelligently plan and efficiently buy audiences on broadcast TV channels akin to digital advertising today. 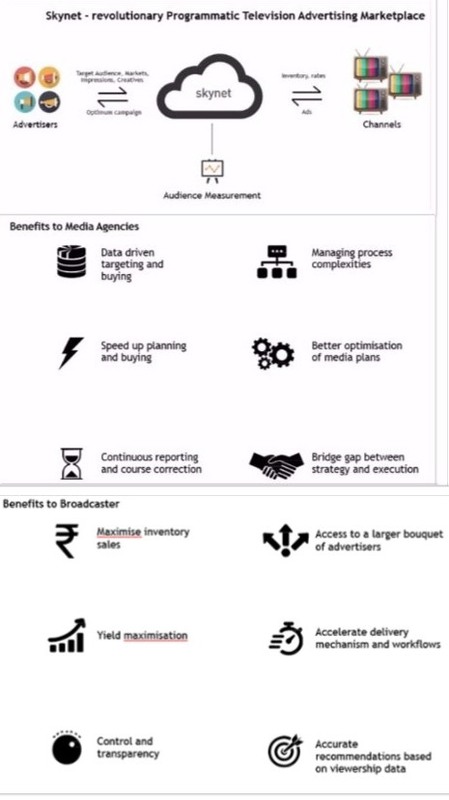 Moreover, it guarantees media agencies absolute and measurable implementation of a brands' television campaign. In a first for the global television industry, media convergence pioneer, SureWaves MediaTech today announced the launch of its pathbreaking Programmatic Television Advertising Marketplace – ‘Skynet’. SureWaves’ new offering represents a paradigm shift in the world of television advertising. Programmatic advertising has been prominent in digital media and has proved to be highly efficient and accountable, but it has not been successfully implemented, end-to-end on television before. Programmatic TV is data driven, technology-based empowerment of the planning, buying, measurement and optimization disciplines of traditional television advertising. Skynet is a first-of-its-kind Programmatic Television Advertising Marketplace that enables marketers to intelligently plan and efficiently buy audiences on broadcast TV channels, akin to digital advertising today. It offers media agencies the possibility of executing advertising campaigns on broadcast channels in a simple, systematic and accountable manner. Agencies on behalf of advertisers can use this platform to seamlessly plan and execute campaigns over a large spectrum of broadcasters. Traditionally, television advertising planning has been a complex, time consuming process. Moreover, it has been difficult for planners to get instant data on their campaigns, thus prolonging the time for course correction. Skynet seeks to change that with robust technology using sophisticated planning algorithms that guarantee absolute and measurable implementation of a brands’ television campaign. BARC India is the Data Partner for Skynet, ensuring constant and accurate updates on viewership figures and trends. Skynet with its new age technology and far-reaching impact, has already seen widespread interest from leading media agencies in the country.